The National Virtual Disability Conference, held on the 21st March, 2018, was the first of its kind in Australia and capitalised on technology and access features not brought together in this format before. The conference was an initiative of the Scope Australia / University of Melbourne partnership which focusses on improving the lives of people with a disability and addressing issues of inequality and social inclusion. Led by Professor Keith McVilly, Scope’s Professorial Fellow of Disability and Inclusion at the University of Melbourne and coordinated by Dr Meredith Prain the event focused on the four key streams: Health and wellbeing; Community living; Lifelong education; Meaningful occupation. Presentations for each stream were led by international and national key note speakers and followed by a panel discussion. Panel members included people with disability, family members, service providers, researchers and policy makers. 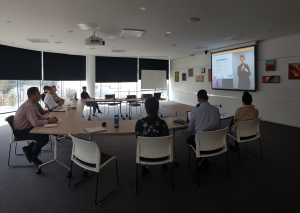 In addition, individual presentations curated from a national call for papers were given by researchers, service providers and people with disability from across Australia. Using communication technology delegates were able to engage in real-time discussions with the panel and submit questions for speakers. In addition, to optimise accessibility, all conference sessions were Auslan interpreted and captioned. The Scope Australia Communication Inclusion Resource Center (CIRC) also provided Easy English summaries of the conference presentations for download. E-posters and abstracts of papers were available on the conference website and accessible to screen reading software. The inaugural event was able to break down barriers for people who may not have previously attended conferences, such as travel and accommodation costs, enabling people to participate from wherever they were in the world. Positive Behaviour Support – how do we know we are making a difference? Positive behaviour support (PBS) is an established, evidence-based approach for supporting people with behaviours of concern. A key component is that PBS teams collect and analyse data to determine the effectiveness of their services, for example, through baseline data that is collected to compare outcomes at later dates. Outcomes measurement addresses the question “are we making a difference?” and assists participants to monitor change associated with the services they receive. This paper gives a summary of leading outcome measures from the field, spanning clinical (e.g., behaviour rating scales) and personal outcome domains (e.g., quality of life, participation). We give an example of how we are putting outcomes measurement into practice at the service level through Scope’s PBS team for measuring behavioural change, quality of life, and personal skills. The paper gives practical suggestions for how teams can feasibly incorporate outcomes measurement into their day to day practice for measuring progress to reduce behaviours of concern and improve quality of life. Identifying and managing pain effectively in people with severe or profound intellectual disability (ID) can be challenging. Often there are difficulties with assessment, and staff lack knowledge about pain and its treatment. Consequently, pain is often underreported, undertreated and undiagnosed (Temple et al., 2012). There are no standard procedures for assessment and treatment of pain in individuals with severe or profound ID and few resources exist to educate support workers and carers about how to assess and respond to pain (Findlay, Williams, Baum, & Scior, 2015). The current study describes the development and efficacy of a Pain Awareness Intervention for support staff and family members of adults with severe or profound ID and pain living in shared supported accommodation. A total of 35 support workers and carers participated in an education session and administered one of two behaviour checklists (The DisDAT and the Abbey Pain Scale) over three months. Pre and post-education questionnaires assessed differences in participant knowledge, attitudes and confidence identifying and managing pain. Changes before and after the intervention will be explored and implications for practice discussed. Major sponsorship and partnership was provided by Scope Australia and National Disability Services, with minor sponsorship from WorkSafe, Transport Accident Commission, and Telstra and support from Occupational Therapy Australia. Scope’s mission is to enable each person to live as an empowered and equal citizen. We support people with physical, intellectual and multiple disabilities and developmental delays to achieve their goals. Across Victoria, Scope provides services to over 5,000 people with a disability across more than 108 service locations. Scope also works with corporate and community organisations to improve inclusiveness for people with a disability. Scope’s foundations stretch back to 1948, when a group of parents who wanted better lives and options for their children with disabilities established the Spastic Children’s Society of Victoria. Scope acknowledges the support of the Victorian Government.